Four St Andrew’s pupils, Henry Torr, Alex Holmes, Dane van Duren and Michael Thomas are part of the national junior coxless IV team. The pupils, along with St Andrew’s Director of Rowing Chris Holliday, have been preparing hard for their participation at the World Junior Championships in Trakai, Lithuania at the beginning of August. They will be continuing over half-term with their training. 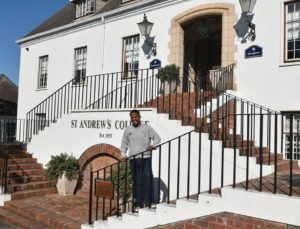 Meanwhile, Sheldon Nelson commenced an internship with St Andrew’s, supported by Rand Merchant Bank. Sheldon will be acting as head coach for Nemato Rowing Club based in Port Alfred. He will be mentored by Chris Holliday and duel Olympic Oars woman, Micheen Thornycroft. The St Andrew’s Junior Four recently took time out of their training to spend time rowing with the Nemato rowers and to talk about their preparations for the Junior World Championships.